The Best dogs for kids and family life can be almost any breed, but there are some breeds with a propensity to enjoy the company of children more than others. No guarantees are offered for any particular breed. This page is intended a starting point, but we ultimately hope that any breed you choose, be it a mixed breed from the shelter or purebred from the shelter ...because we hope you'll adopt :)... should be chosen with the intention of giving him proper training, as well as teaching the child proper respect and boundaries when it comes to the pet. find the most complete compilation of the best dogs for kids below! We've chosen these dogs because we've spent a great deal of time with them, owned them, known others who've owned them or researched them extensively for you. All you have to do is pick one, then research their characteristics and maintenance needs to determine which one is the best fit for your family and lifestyle! Best wishes on finding the best dog for your kids! 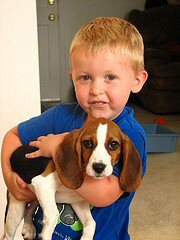 If you love the sounds of a mournful howl and don't mind a little shedding, in my humble opinion, a beagle is one of the best dogs for kids of any age. 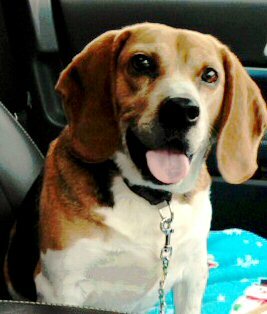 Typically eager to please, happy and ready to play, who wouldn't love the easygoing beagle! Looking for a breed that's easy to train, always ready to play and has more energy than your child? Also entertaining to children is the loud snoring and farting :)! Learn more about Boston Terriers here. Awww! A fluffy white Bichon Frise is sure to melt the heart of any child. We would usually warn against mixing toddlers with any small breed dog, but if your child is taught respect from an early age, a dog like Beverly is probably looking for you, as well! Check petfinder.com to find a dog like Beverly near you. 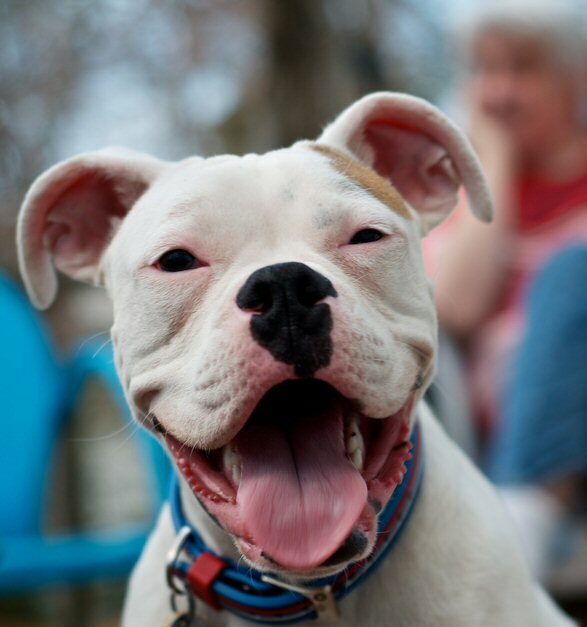 You'd be hard pressed to find any dog as goofy and playful, yet loving, patient and sweet-natured as a Boxer. Sadly, like many breeds that are over bred, they end up in shelters through no fault of their own. Don't get me started on irresponsible dog owners! If you think a Boxer might be a good suit for your family, do your research, then choose adoption! 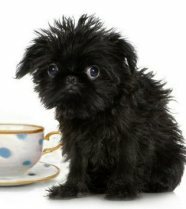 Petfinder.com is a great place to start! Looking for a high energy dog to match your high energy elementary age student? 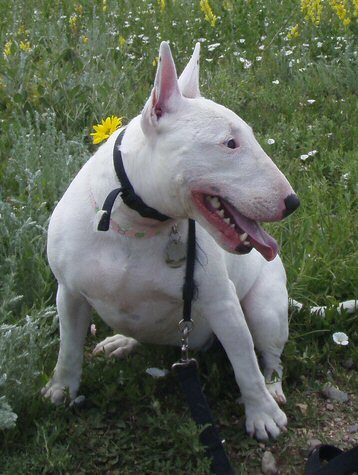 A bull terrier would be a good dog to research if your child is 6 years+ and polite and respectful. But because they're energy makes them akin to little wrecking balls, they probably wouldn't be the best dog for kids around toddler age or younger. It's Toto! 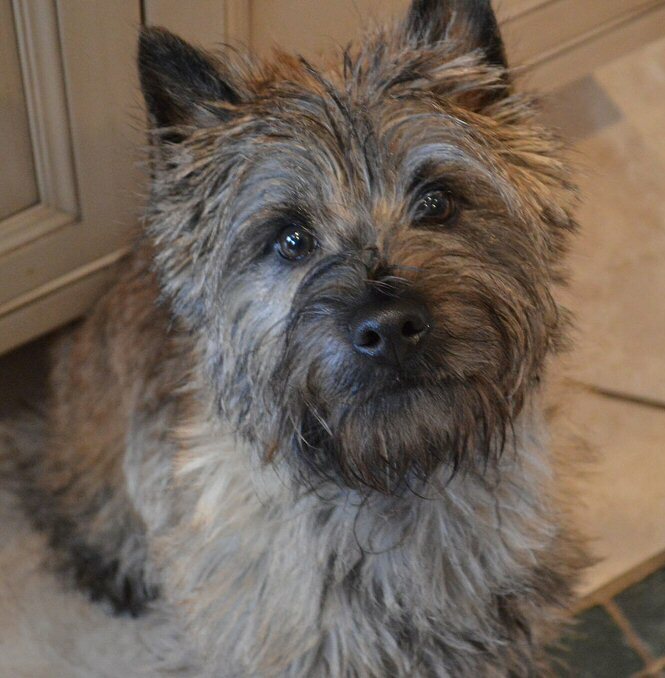 Ok, it's not actually Toto from the Wizard of Oz, but Toto was a Cairn Terrier. This breed, in general, usually loves children, but it's a terrier, nonetheless. Be vigilant with any dog of any breed around any child. Kids will be kids just as dogs will be dogs. A Happy Camper, indeed. 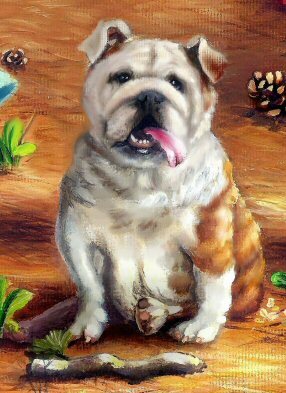 Don't let the heavy frown and the mean looking stance fool ya on an English Bulldog or Olde English Bulldog. These guys are full of gentle kisses and lots of love. Probably not the best dog for chasing sticks in the park as they overheat easily, but a more willing companion to a polite child you'd be hard-pressed to find. Labrador Retrievers get high marks across the board. Great with kids of almost any age, young or old, they are also one of the smartest breeds and true people pleasers. Unfortunately irresponsible dog owners have made labs one of the most widely available in shelters, which is never a good place to end up when you love family life like a lab does. Chocolate, Yellow or black, you can't go wrong with a lab... And you're sure to find one who needs you just down the road at your local shelter, just like Butterscotch on the left. Read the paragraphs below about finding, rescuing and adopting the perfect dog! Standard poodles are great with children. Most are laid back, especially after the puppy years when they're just a bit more high strung. But that's true for most breeds. Don't forget that adopting this breeds also means adopting a new ritual of visits to the groomer... But really, if you don't plan to trim nails regularly, bathe regularly and so on, you'll need to find a regular groomer anyway. 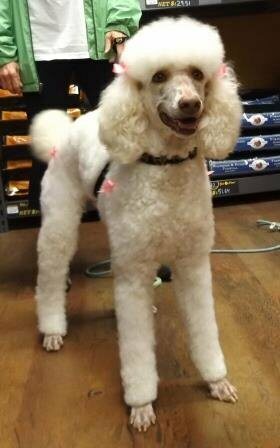 So why not a beautiful, large, gentle and sweet-natured standard poodle. Check petfinder.com and adopt a girl like Lulu on the left if a standard poodle is on your list. Although a toy breed, Havanese are one of the few in this category that we would consider a great family pet, even for a family with children. In all actuality, a puppy of any breed isn't a good idea for a 2 year old, but if your child is older, say 6 years or older, then a Havanese might fit right in! 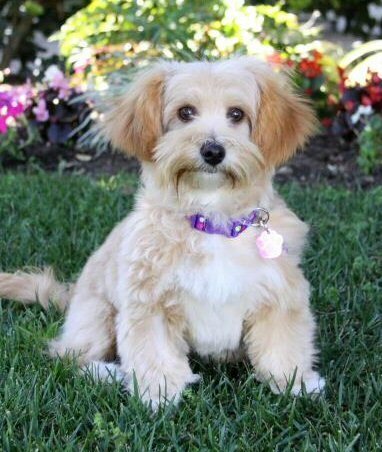 You can learn a lot more about the Havanese right here! Then if you decide that this is the dog for you, check out petfinder.com to adopt a dog like Kandie on the left! A Cavalier King Charles Spaniel would make a wonderful companion for your school-age child. While great with children and a perfect companion for adults as well as children, this breed is not without it's problems. Learn as much as you can about the Cavalier King Charles Spaniel, just as you would with any breed before bringing one home. Rarely excitable and the perfect size... not to mention ADORABLE! 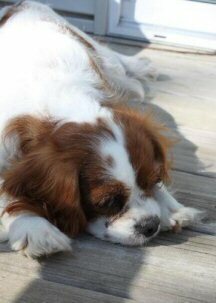 Learn more about the Cavalier King Charles right here! Adopting an adult Cocker Spaniel is GREAT way to ensure that you get all the breed characteristics you're looking for, including "Great with Children". The shelter or rescue group of your choosing will most likely already know if the dogs they have are good with children. Adopting an adult dog comes with several bonuses! Already out of chewing phase, more likely to be housebroken and his temperament will already be established. Best of all, you will forever be his hero! 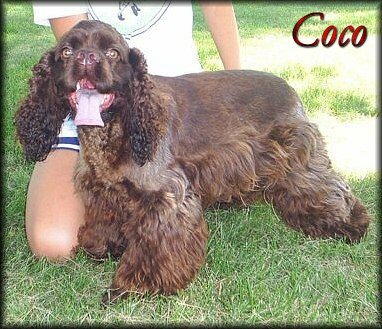 Learn more about Cocker Spaniels here! 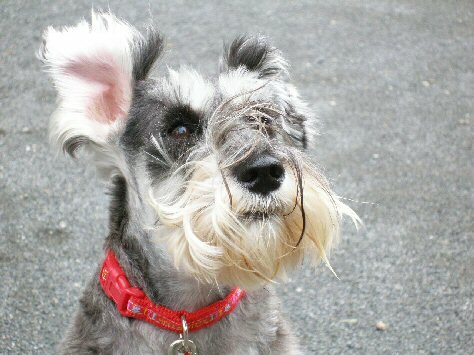 Not particularly fragile, a Miniature Schnauzer makes a great family pet and yes, this breed (as a rule) is great with kids in most situations. Just remember this, all dog have the ability to inflict injury. If your child is too small to understand boundaries, it's not fair to the dog or the child to expect too much. Dogs are not babysitters and most toddlers aren't gentle. However a child a little older than toddler age who understands that dogs don't like to have their eyes poked might be the perfect playmate for a Miniature Schnauzer. Jack Russell Terriers love to play and would be great for an older child who loves to run and doesn't mind throwing the occasional stick! Between the two of them, they could wear each other out and your job is done! Your child has a friend to keep him away from the television and your dog has a playmate... it's a win-win, really! This breed is also easy to come across at any shelter, nationwide. 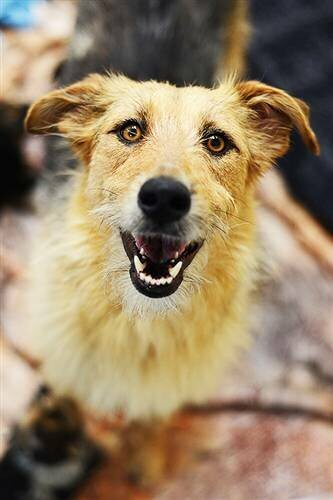 A mixed breed dog brings all the loveable qualities of every breed, all rolled into one! They are unquestionably smarter, have fewer health problems and are just as loveable as any fancy-schmancy purebred. Already have a breed in mind? Perhaps a lab? 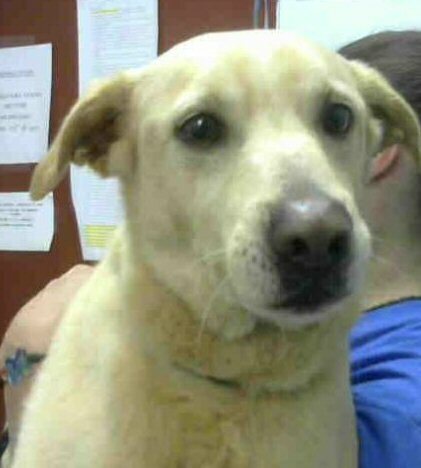 Check out petfinder.com and enter Labrador Retriever into the search bar along with your zip code... Then don't scroll past the lab- mixes. You'll never regret a decision that saves a life... and your dog will never stop repaying you with unconditional love! Almost any dog can be a great family dog. Go to the shelter. 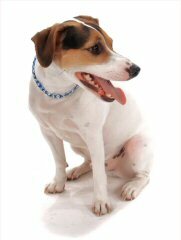 Look for a dog who will match the energy needs and lifestyle of your family. If you don't want a dog that you will have to fuss over, then don't choose a high maintenance dog. If you want a dog who's happy to lay around most of the day, adopt an older adult dog. Want to know which dogs I personally wouldn't recommend for kids? If I were looking for a playmate for my toddler-age babies, I probably wouldn't start off with a tiny chihuahua for obvious reasons... and I love chihuahuas! If you're unsure why, start here. And, for the sake of argument, I know that many people swear by pit bulls being great family dogs and I do believe that most of them are. (Before you send me hate mail, read all the way to the bottom of the page.) For me, pit bulls teeter somewhere between great family dogs and dogs that scare the crap out me when it comes to kids... but they aren't the only breed that I wouldn't recommend. I have owned and loved sweet-natured doberman's who were great family pets, but based on my experience with the breed in general, they are sometimes unpredictable and temperamental. Choose Rescue. You can't go wrong. In general, the best dogs for kids, of ANY breed would be the one you'd find within a rescue group who's proven themselves to be great around children. I'd argue that point to anyone who challenged me on puppies who've been raised with children being the better of the two... from personal experience alone. An older dog with a proven personality is the far better of the two. For all of you who would want to disagree with me, please understand that I've already considered all of your arguments and heard all of the stories that would contradict my well-thought-out opinions on all of these breeds. 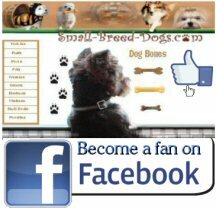 The fact is that ANYONE can breed a dog, and most of the breeds on this page are a dime a dozen, bred for the sake of making a few bucks by someone who has no earthly idea about breeding for the sake of temperament or breed standard. Use due-diligence when "shopping" for a dog... and please consider adoption no matter which breed you choose. THERE ARE SO MANY BENEFITS, I made a whole page about it! Seriously, take a look! ears, nails, teeth and pads.